It's not every day that one receives a cancer diagnosis. IT’S NOT EVERY DAY that one receives a cancer diagnosis. I’ve been healthy all my life. Cancer doesn’t happen to me; it happens to “them.” Then I discovered that it can happen to anyone—it happened to me. The two words that every woman fears: breast cancer. I DIDN’T realize that my whole life was about to change. That was when I first met Cindi Cantril. She had the unpleasant task of giving me the news. I knew when we first met that she was someone I could trust. Little did I know that she would become a huge part of my life. It wasn’t what she said or did. It was the feeling of compassion and sincerity with which she spoke. It was the confidence and reassurance in her voice that she’d walk with me every step of the way and that I’d get through treatment. It’s her dedication to serve, her desire to give unselfishly of herself, her commitment to helping women. And she does it all with a great smile and a positive attitude. Cindi is one of those special people who was blessed with the gift of serving, of giving unconditionally from the heart. Once I received my diagnosis, she and her team at Cancer Support Services and Patient Navigation banded together and assisted me every step of the way, scheduling tests and physician referrals, advising me on what to expect and providing information to help me make good, sound decisions on my treatment options. She became a member of our family, supporting my husband and our children. The big day was upon us: surgery. As I sat with my husband, Jerry, in the waiting room for my presurgical wire implant, I began to feel a lot of anxiety building up. Cindi had shared some relaxation exercises with me, and I just couldn’t get myself to settle down, even with Jerry by my side. Out of the blue, I felt someone sit beside me and take a hold of my hand. I looked up, and there was Cindi, smiling and reassuring me that everything would be all right. She met me in the room where the procedure was about to take place. She made sure I was comfortable and relaxed, and then she left the room. Unbeknownst to me, she went out to the waiting room to be with Jerry, providing support and a shoulder to lean on. The development of WINGS came about when Cindi saw a need for a program where women could help other women with a similar diagnosis. She looked at existing programs across the country as models for the program she intended to develop. She took the best practices from several established programs and put together a program that would work for our community. Once the framework was set, she hand selected the first group of volunteers. Working tirelessly, the volunteers (I happen to be one of them) were trained to listen generously with an open ear and an open heart. Many newly diagnosed women have been paired up with volunteers, and the results have been amazing. The program has been so successful that it’s expanded to support not only breast cancer patients, but women with other types of cancers and a men’s group—WINGMEN. Cindi has done numerous presentations on WINGS and is working diligently to expand the program to other facilities. Outside the office, Cindi is an avid equestrian at heart. 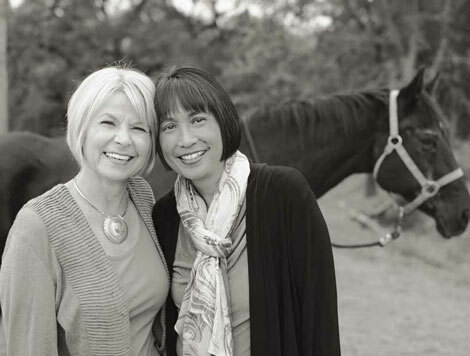 She’s combined her love of horses with her desire to help patients heal by developing Sutter Cancer Support Services’ equine facilitated therapy program. Cancer treatment is more than diagnosis, surgery, radiation and chemotherapy. It is also a healing of the mind, body and spirit. The healing power of horses cannot be explained, not by science anyway. I learned about the principles of horsemanship, about reconnecting to the natural world. I learned to focus on the here and now, not the maybe’s and what if’s. It renewed a lot of values that had somehow gotten lost in this busy world, values such as trust, respect and partnership. I learned to trust my intuition rather than to question it. And I’ve learned to become more curious about the world around me, curious about what I can do to make it a better place. On the clinical side, participants had salivary swabs taken three times a day during the program that were used to measure salivary cortisol levels in the morning, before working with the horses and after. As expected, cortisol levels dropped measurably over the course of the program. Yes, science was very instrumental in measuring cortisol levels; however, we have yet to find out why these changes occurred. Cancer treatment is stressful, and Cindi understands how much it takes out of a patient. In an effort to help women heal even more, she organizes annual three-day retreats for cancer patients, so they can pamper themselves, meditate, share their experiences and help one another heal. She brings together an amazing group of speakers and coordinates activities that energize the spirit. Cindi has been a member of our community in Santa Rosa, California, since 2010 and has brought all of these programs to reality. That’s quite an amazing feat for such a short amount of time. The lives she has touched and the impact she’s had on so many women and their families cannot be measured. Cancer, believe it or not, has changed my life for the better, and I would never have met this remarkable woman otherwise. It isn’t that she’s done one thing that’s really extraordinary—it’s the extraordinary things she does every day.